This year we are presenting a lineup of eight curated installations for the third annual SXSW Art Program. Selections for SXSW 2019 were made in collaboration with the SXSW Art Program Advisory Board including Andrea Mellard of the Contemporary Austin, Suhair Khan of Google Arts & Culture, Kim Cook of Burning Man, and more. The SXSW Art Program showcases immersive art installations created by artists from all over the world. This year’s selections use technology as a vehicle to explore a variety of topics including the human spirit, cultural traditions, and how we interact with our environment. These installations will facilitate discussion around the role of visual and digital media arts in modern society, shared spaces, and technology. The 2019 SXSW Art Program includes: Blooming by Lisa Park; Belongings by John-Paul Marin, Matt Smith, Patrick Abboud, Tea Uglow, and Kirstin Sillitoe; EVERY THING EVERY TIME by Naho Matsuda produced by FutureEverything; hash2ash and APPARATUM by panGenerator, Krzysztof Cybulski, Krzysztof Goliński, and Jakub Koźniewski; Semeion by Circuit Circus; Weaving by Cocolab; and Arctic Passage by Louie Palu. This lineup of artists joins events across the entirety of SXSW that showcase innovation, diversity, and creativity in visual and media arts including The Contemporary Austin, Facebook Art Department, UNESCO New Media Arts Exhibition, and more. New for 2019, there will be a series of sessions in the SXSW Conference within the Design Track that feature art-focused conversations. Listed below are Conference sessions and additional highlights relating to the Art Program. Learn more during these art-related sessions within our 25 Tracks of programming at the SXSW Conference. Explore art-related world premieres in the Documentary Feature Competition screening section at the SXSW Film Festival. 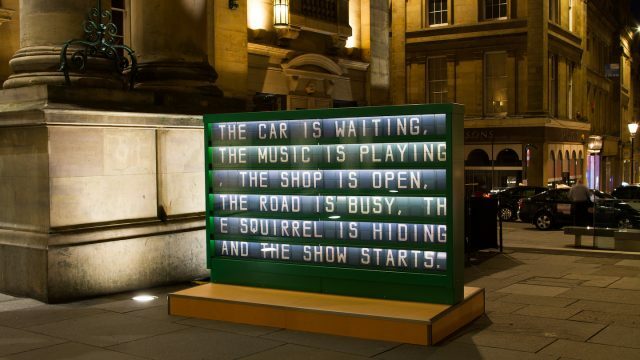 Want to see the installations at SXSW 2019? Register before the February 15 deadline to save $100 on the walk-up rate and book your hotel using SXSW Housing & Travel for the best rates and locations close to the action. Sign up for SXSW Event Updates and read SXSW News for announcements, deadline reminders, programming features, and beyond throughout the 2019 season. Follow us on social media for daily updates – Twitter, Facebook, and Instagram.